Meet Michael—the newest member of The Craig Diez Team. Michael graduated from Arizona State University in 2011 with a B.S. in Supply Chain Management. His strong education and background in the business field has made him a natural fit for his new role as Transaction Coordinator, where he serves as a liaison between The Craig Diez Team and other agents, clients, escrow companies and mortgage brokers to ensure a smooth and successful real estate transaction from start to finish. Michael’s previously worked as a Purchasing and Logistics Specialist for Navy Ships, where he managed and communicated with eight different ships, all with varying requirements. His past experience has given him a unique skill set in the areas of time management, communication and organization, all of which are essential to a smooth transaction. Michael also brings with him a strong sales and people background, having been a Service Advisor for Subaru in Shingle Springs, where he directly worked with clients to determine repairs, work and ongoing maintenance. 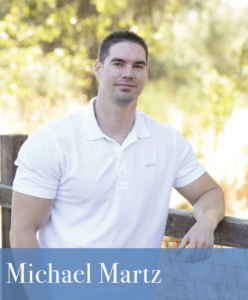 Michael recently earned his real estate license and looks forward to helping The Craig Diez Team grow. Michael’s hard-working nature and his love of people make him the perfect addition to The Craig Diez Team. In his downtime, this El Dorado Hills native enjoys spending time with his friends and family, working out and playing basketball. Please fill out the below information and Michael will be in touch with you shortly!